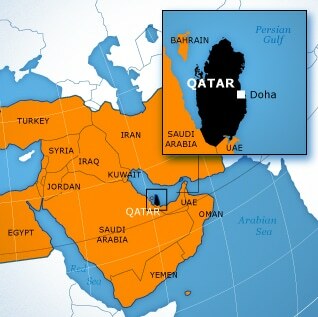 Official name: State of Qatar (Dawlat Qatar). The small peninsula of Qatar in the Persian Gulf is about 160 kilometres in length and between 55 and 90 kilometres in width. Its total land surface covers 11,437 square kilometres. Qatar’s coastline is 563 kilometres long. The only land border, with Saudi Arabia in the south, measures 60 kilometres. The climate is hot and extremely humid in summer. Winters are generally mild. With an average annual rainfall of just 81 millimetres, Qatar is one of the driest countries on the planet. Recent discoveries indicate human presence in Qatar in pre-historic times, but for most of its history the arid climate discouraged anything other than only short-term settlement by nomadic tribes. In 1872, the Ottoman Empire, since the 16th century the most dominant power in the region and far beyond, extended its mainly indirect rule to Qatar. They recognized the ruler of Qatar, Sheikh Mohammed bin Thani, who had his capital in al-Bidda, the present city of Doha. With the decline of the Empire, culminating in the defeat of its allies Germany and Austria-Hungary during World War I, the British filled the gap as protector of the region. The British protectorates were territories for which Britain assumed responsibility for external affairs and defence. They were usually created as a means of acquiring control in order to advance British financial, commercial, and other interests. The authority and institutions of the indigenous people were usually preserved in accordance with the British policy of ‘indirect rule’. By the time the Ottoman withdrew from Doha in 1915, local power had passed to Sheikh Abdullah bin Jassim Al Thani, who signed a treaty with Great Britain in 1916, which was similar to those entered into by the British with other Gulf principalities. Under it, the ruler agreed not to cede any territory and not to enter into relationships with other foreign governments without British consent. In return, the British promised to protect Qatar from outside aggression. In 1968, Great Britain announced that it was to end its treaty relationships east of the Suez, including those with the Gulf sheikhdoms. Qatar subsequently joined the eight other states then under British protection in a plan to form a union of Arab Emirates. By mid-1971, as the termination date of the British treaty relationship approached, the nine countries still had not agreed on terms of unification. Accordingly, Qatar declared its independence as a separate entity and became the fully independent State of Qatar on 3 September 1971.